Up until now, your child has spent a lot of time being coddled and held and taught. Now that she’s 2 years old, she’s ready to take on the world on her own terms. While turning 2 brings other exciting milestones, one most notably is the prevalence of tantrums and other acts of defiance. While you might think your toddler is being naughty just to push your buttons, there is a method behind the madness of the "terrible twos." The twos are terrible for two reasons -- your child seeks independence and throws a fit when he doesn’t get what he wants when he wants it. 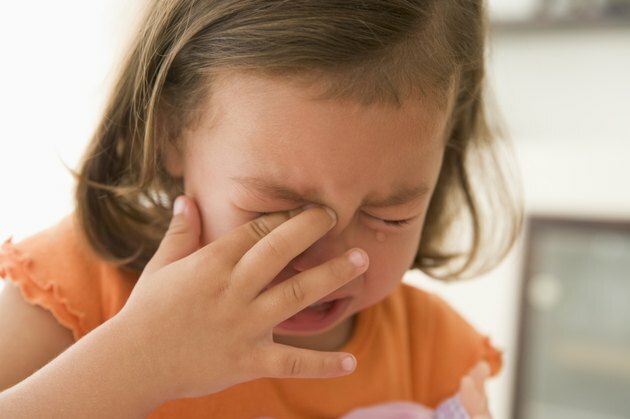 When disciplined, some 2-year-olds may cry, others may laugh or throw a total meltdown. Though it appears your child may have lost their mind, the truth is he is just testing your limits. According to AskDrSears.com, setting limits shows your child that you are dependable and will protect them from harm. Without limits, the world is a scary place for your 2-year old. Two-year-olds are naturally curious. That often means getting into things, making a mess and other aggravating mishaps. Keep your cool and realize your child is learning about the environment around her. Maintain a set of rules for your child to follow and stick with them. Don’t say “no” one day then let her bad behavior slide the next day because you’re too tired or you just don’t want to deal with a temper tantrum. This sends a mixed message to your child and will often make her skeptical of your discipline methods. Many parents rely on time-out, or other similar methods, as a form of discipline. However, family life educator Sandy Bailey explains, most children will not understand the concept of time-out until they are at least 3 years old. If you use time-out, it is important to explain to your child why he is going to time-out in the first place. Simply putting your child in the corner without an explanation will not stop the problem from occurring again. Be prepared to repeat yourself many times before he understands what not to do. Avoid long-winded lectures; a simple explanation is all you need. If your 2-year-old continues to laugh at you the next time you discipline her, change how you discipline her. Take the time to teach her how to fix what she did wrong. For example, if you yelled at her for not picking up her dolls, teach her how to clean up --and make cleaning up seem like a fun thing to do. After she gets the hang of it, praise her when she cleans up her dolls unprompted or performs any other good task. That way she will learn she doesn’t have to be rotten to get your attention.